The Circle's own WRRC Journal published twice yearly in May and November. Members receive the latest issue free. Back copies are available for members at Rhiwderin when the centre is open (events diary), Members price £1.00p, plus £1.60 postage. Postage discounts on multiple purchases. Contact: Andy Nicholls for availability. WRRC offer three types of Cordex binders. 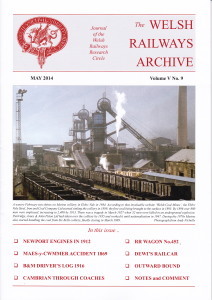 RED, with 13 cords and blocked on the spine for the Circle's magazine, Welsh Railways Archive. BLUE, with 13 cords and WRRC logo blocked at base of spine, of the right size for Archive, Railway Archive and magazines of similar size..
GREEN, with 13 cords and WRRC logo blocked at base of spine, of the right size for Model Railway Journal, GWR Journal, HMRS Journal and other magazines of similar size. If you wish to mix GREEN with either of the others - say GREEN & RED as a pair - divide the multi-pack prices to get a price per binder and write your cheque accordingly, £16.00 in this case. Non-members will pay an extra 50p per binder. At exhibitions and Rhiwderin when the centre is open (events diary), RED and BLUE binders will be £7.00 to members and £7.50 to non-members. GREEN binders will be 8.00 each and £8.50 to non-members. Cheques, payable to Welsh Railways Research Circle, please.